GERMANY: Citizens' projects again dominated the German federal agency's onshore auction, as it awarded contracts for slightly more than 1GW of projects. Sixty-one contracts were awarded, with a combined capacity of 1,000.4MW. Citizen projects made up 98% of the successful submissions and 99.2% of the total capacity. Winning bids ranged from €22/MWh to €38.20/MWh, with citizens’ projects receiving the upper limit as per the rules of the German auction system. The weighted average winning bid of €38.2/MWh is in the range of wholesale market prices traded in the futures electricity market in 2018 and 2019, indicating that if the winning project owners commissioned their projects within the next two years they could expect to operate in the market with little, if any financial support. These latest winning bids were 16% cheaper than that of the €42.80/MWh offered in the last auction in August. 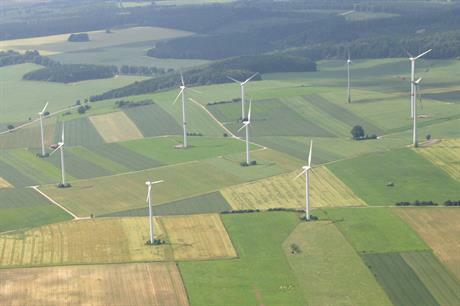 The results, announced by the federal energy regulator Bundesnetzagentur (BNA), "clearly show how quickly the need for onshore wind support is shrinking for projects to be built after 2020," said wind energy trade body Bundesverband Windenergie (BWE). Most of the new successful bids were from the states of North Rhine-Westphalia, which had 17 winning projects, and Brandenburg, which had 16. The tender was the third this year and was heavily oversubscribed, said BNA, with 210 bidders submitting a volume of 2,591MW. Citizens’ groups put forward 89% of these bids, the agency said. Under Germany's renewable energy act, wind project owners successful at auction get a market premium calculated as the payment allocation they won at the auction minus the average market value of their electricity. Potentially, owners will, where possible, wait until wholesale electricity prices recover to a reliably higher level. Some market players anticipate significant price increases in the run-up to completion of Germany's nuclear phase-out at the end of 2022. A lignite and coal phase-out and effective CO2 pricing, both being discussed in Germany, would also help to push up prices — although German industry is resisting measures that will result in higher prices. German onshore wind auction rules allow so-called "citizens' wind projects" to be bid without having permits and where successful, up to four and a half years for implementation. Projects successful at auction in 2017 could, therefore, delay commissioning until 2021. However, 2,730.4MW of the 2,820.4MW of onshore wind projects allocated support at the three auctions in 2017 are owned by enterprises that fulfil the legal definition of a citizens' wind projects. As a result, "there is a big danger that in 2019 and 2020 there will be a hiatus in wind energy expansion that will hit turbine manufacturers, component suppliers, logistic companies and wind project planners and massively slow the Energiewende," warned BWE president, Hermann Albers. Earlier this year, community projects won 96% of the total project volume in the first tender and 95% in the second. After recognising the problem, the German government decided that in 2018, all wind projects bid into the first two of the four 700MW auctions that year are, as a pilot experiment, required to have permits. This should ensure fairer competition between citizen‘s and non-citizens‘ projects and swifter implementation. Pierre Tardieu, WindEurope’s chief policy officer said it was encouraging to see the cost of onshore wind falling again, but raised concerns that the German auction system would lead to a slowdown in installations in 2019 and 2020. "This cost reduction is driving wind energy to become the leading source of electricity in the EU soon after 2030, as recently stated by the IEA," he said. However, Mr Tardieu added: "The current auction design gives so-called community projects longer lead time to build the project. A slowdown and non-realisation of certain projects will hit manufacturers, suppliers, and others in the supply chain. "It’s unsettling to see this slowdown in Europe’s leading market at a time of increasing global competition. "The system also allows community projects to bid without a permit. Ordinary projects are at a competitive disadvantage as they are locked in the existing technologies specified in their permits. Community projects on the other hand can factor in the better yields of future turbines when bidding. "These shortcomings in the auction design were already recognised after the first onshore tender in May this year. Having a permit needs to be a prerequisite for participation in onshore auctions in 2018 and beyond."